Add a bit of Colour to your Cuffs! Classic yet modern barbell-shaped cufflinks in solid sterling silver. These cufflinks are the perfect present for the stylish gentleman as well as for the lady who prefers to wear more formal shirts, as they fit both ladies and mens shirts with a double cuff. 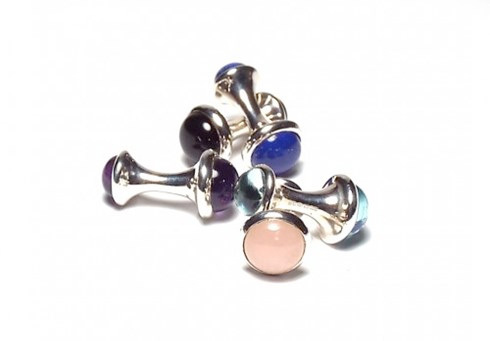 The sterling silver cufflinks are set with onyx, rose quartz, topaz, amethyst or lapis lazuli cabochons. The cufflinks are handmade of solid 925 Sterling Silver, are hallmarked by the London Assay Office and carry the maker’s mark ‘MMzS’.